AMO GmbH and RWTH Aachen University will be funded in five sub-projects in the 2nd phase (2018-2021) of the Priority Programme “High Frequency Flexible Bendable Electronics for Wireless Communication Systems” (FFlexCom, SPP 1796) with about 1 million Euro. The joint activities will be carried out within the Aachen Graphene and 2D Materials Center. In the first funding phase of SPP 1796, launched by the German Research Foundation (Deutsche Forschungsgemeinschaft, DFG) the two Aachen institutions have already been working together successfully since 2015, with the aim to enable functional flexible systems at sufficiently high operation frequencies for wireless communications. 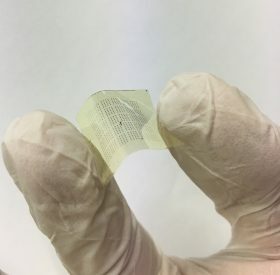 Up to now, different thin film organic and large area electronics (TOLAE) technologies have been explored, including but not limited to organic semiconductors, metal oxide and carbon-based materials (e.g. graphene). Thanks to its unique high frequency response in combination with its super flexibility, graphene is considered as a promising candidate. In the first phase of FFlexcom, the project “GLECS – Graphene enabled flexible high-frequency electronic circuits”, led by Professor Renato Negra from RWTH Aachen University and Dr. Daniel Neumaier from AMO, significant contributions were made to the field, with flexible communication circuits based on graphene materials. In line with the final target of the SPP1796, the research focus in the 2nd phase will be shifted from circuit design and fabrication to system realization (GLECS 2). In addition, high hopes are placed on the newly funded project, “MOSTFLEX – Scalable MoS2 based flexible devices and circuits for wireless communications”, to expand the vision of the priority program and provide more opportunities for future flexible electronics. RWTH Professor Max Lemme and Renato Negra as well as Dr. Zhenxing Wang from AMO will investigate the novel 2-dimensional material MoS2. The goal is to utilize these materials for field-effect transistors, different communication building blocks such as transmitters, receiver and finally a complete wireless data communication system on flexible substrates.